Last year Voyager 1 has left our solar system. Kind of, depending on how you look at it. There were lots of stories in the news about how NASA officially announced that Voyager 1 has left our solar system, but the actual announcement was that the probe has crossed what is known as the heliopause. Eventually the stream of the solar wind slows down enough that the interstellar wind can push back, which creates a boundary known as the heliopause. Beyond the heliopause, the interstellar wind dominates. Beyond the heliopause is interstellar space. Declarations that Voyager 1 has left the solar system have appeared off and on the past couple of years because the heliopause is not a hard line. Depending on solar activity it can vary a bit. Then there is the limitations of Voyager’s sensors. The probe is 36 years old, and most of its detectors are no longer operational. It’s transmission power is only about 23 watts, which is about the power of a refrigerator light bulb. The probe still has two antennae that can detect magnetic fields. By observing the oscillations of magnetic fields, you can also get a handle on the density of ionized particles around Voyager 1, since the frequency of oscillations depends on the density of the plasma. In a recent paper it was shown that the density of electrons around Voyager has increased by a factor of 40. This is exactly what was expected as Voyager leaves the tenuous outer region of the heliosphere to enter the region of interstellar space. If you define the limits of the heliosphere as the edge of our solar system, then Voyager has indeed achieved this task. But as you can see in the image above, this isn’t what is commonly thought of as the edge of the solar system. For one, Voyager is still under the influence of the Sun’s gravity. There are lots of objects that orbit the Sun at a distance much greater than Voyager. For example, the orbit of Sedna (a 1,000 km wide trans-Neptunian object) takes it more than 900 AU from the Sun. In comparison, Voyager 1 is about 125 AU from the Sun. So it hasn’t really left the solar system at all. 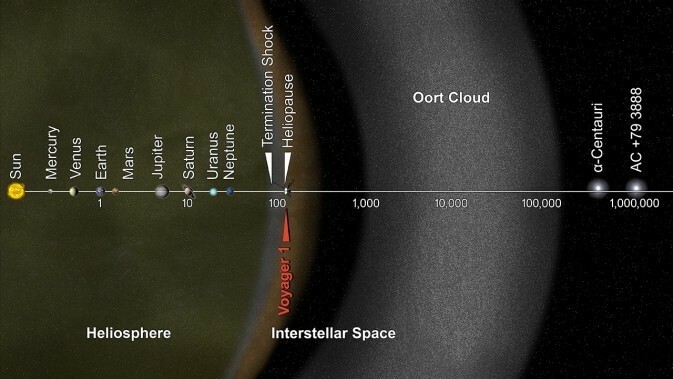 If you consider the outer edge of the Oort cloud to be the limit of our solar system, then Voyager 1 is just getting started. So while you could say Elvis has left the building, he hasn’t yet left town. Couldn’t NASA have installed on this probe some sort of nuclear power that could have last until today and kept all devices onboard in a working state ? They did exactly that. But nothing lasts forever, especially in harsh conditions of outer space. If at some point in the extreme future we overtake Voyager, would we return it to earth or leave it be?